What Do Pumpkin Spice Latte’s Really Do To Your Teeth? As the fall season hits, pumpkin-flavoring is everywhere, including your local coffee shop. 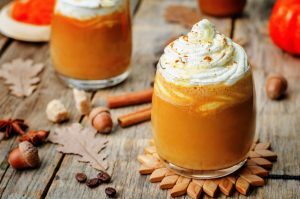 Before you place an order for a pumpkin spice latte, it is important to understand the impact it will have on your oral health. There are many things in a pumpkin spice latte that may harm your teeth. Acid. Coffee of any kind contains acid that can wreak havoc on your tooth enamel. Over time, this leaves your teeth weak and vulnerable to decay. Dark in Color. Coffee is known to stain teeth. Since enamel is porous, the liquid can enter the tiny gaps and leave behind a yellowish color. Even if you brush each day, it is impossible to remove the staining. It will be necessary to use a whitening method to return your smile back to a white appearance. High Sugar Content. The typical pumpkin spice latte that is served at coffee shops contains more than 12 teaspoons of sugar. This is double the recommended amount for a person to consume in one day. Thanks to the high-fat content, this sugar easily sticks to your teeth. In the end, this means that you may soon be suffering from multiple cavities. High Levels of Caffeine. Lattes are filled with caffeine. Many studies have shown that this causes stress that may lead to teeth clenching. As you clench your teeth, you tighten your jaw, which can lead to pain, especially when you chew food. Bad Breath. Besides water, anything you drink may lead to halitosis. As coffee sticks to your tongue, bacteria builds and causes bad breath and other oral problems. According to the America Dental Association, it is wise to use a tongue scraper as a part of your normal oral care routine. Dr. Dana Walters knows that many people enjoy specialty coffees during the months of fall. He is happy to provide tips that will prevent these types of beverages from harming your teeth. For more information, call his office today.